Kids are being robbed of their childhood and innocence due to stress, peer pressure and other influences constantly around them, making it seem like they are maturing faster than ever before. One obvious example of kids maturing faster than they used to is their appearance. 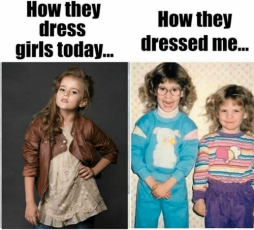 Young girls are wearing more makeup and dressing more provocatively than they did 10 years ago. When I was in lower and middle school, the hit trend was Justice, yet today, girls are shopping at Lululemon. My friends and I grew up wearing the extra sparkly, girly clothes our parents picked out for us, and now little girls are wearing crop tops and short shorts. Parenting style plays a large part in this considering some parents allow their kids to pick out their own clothes, while others choose for them. Obviously, kids with parents that choose for them, are more likely to dress age-appropriate. Preteen boys are also trying to look older and be “cool” by experimenting with trends such as vaping and alcohol at alarmingly young ages. Although their appearance may not be as obvious of an indicator as for girls, they too, are laser focused on fitting in. Another factor in children maturing earlier than they should, that isn’t necessarily new, is older siblings. Children typically look up to their older siblings and want to do everything they do, potentially leading to early experimentation with alcohol, vaping, etc. Because these kids look up to their brother or sister, they try to be like them and their friends, to fit in and be considered “cool.” For those that are an older sibling, have you ever felt like your parents are more tough on you than your younger brother or sister? Personally, I have felt this way many times. Studies from several universities have confirmed that parents are typically stricter on the older sibling than the younger one(s). With the first child parents are still learning and adjusting to a new role, but for younger siblings, parents are more experienced and likely more comfortable and confident in their parenting, which can result in them being less strict. TeenSafe.com claims that kids are physically growing up quicker than they used to and research shows that in the last few decades kids have been entering puberty earlier than ever before. But children wanting to grow up sooner than they should isn’t necessarily new. So what is different now versus 10 years ago? We live in a society where almost everything is accessible through technology, which is affecting how children are growing up. Studies have shown early exposure to constantly-advancing technology is the single largest factor in expediting maturity. “The 12-14 year-olds of yesterday are the 10-12’s of today,” said Vice President of Nickelodeon, Bruce Friend. On average, kids are receiving phones and laptops around the age of 10, giving them easy access to social media. Following celebrities on social media allows children to see uncensored lifestyles which are often flooded with drugs, partying and generally provocative photos. Even movies that used to be geared towards older audiences are becoming available to younger age groups. Over the years, movie ratings have shifted, allowing kids to be exposed to topics previously intended for adult viewers. For example, a PG-13 movie from 10 years ago would not have the same vulgar, inappropriate content a PG-13 movie likely has today. Studies show the movie industry has become more lenient over time, filtering violence and inappropriate content less than it used to. Also, Netflix and other entertainment companies such as Hulu Plus and Amazon Prime, make all types of movies accessible to younger audiences. For instance, a kid could be scrolling through Netflix and pick a show or movie on their parent’s account regardless of the rating or inappropriate content. 10 years ago, when video streaming wasn’t around, parents had much more control over the television and videos their kids were watching – kids didn’t have access at their fingertips like they do today. Less strict parenting styles, the presence of an older sibling and early exposure to social media and technology, all contribute to children growing up sooner they should, sometimes without them even realizing. While this concept isn’t necessarily new, research shows there is a rising trend in kids wanting to grow up at a faster pace, and technology is making it a reality.